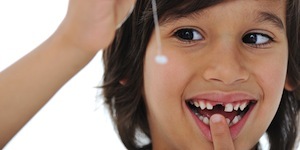 Artistic Touch Dentistry wants you to know what to do when your child’s baby teeth fall out so his or her adult teeth will stay healthy. Erupting permanent teeth cause the roots of baby teeth to be reabsorbed so that by the time they are loose there is little holding them in place besides a small amount of tissue. You should monitor and help your children brush their teeth until they are between the ages of 7 and 10 and you feel as though they can do the job unsupervised. It’s always best to try and brush your teeth within 5-10 minutes after you eat; although this isn’t always possible, try to brush as soon as you can. While brushing twice a day will keep up their oral hygiene, make sure to teach your children how to floss correctly as a way to prevent gum disease. You may also consider putting sealants on your child’s molars. Sealants protect the depressions and grooves of your teeth from food particles and plaque that brushing and flossing can’t reach. Healthy Children reported that, “with a combination of sealants and fluoride treatment, the incidence of cavities can be reduced by 90 percent.” When you need to schedule an appointment for your child then call our office at Artistic Touch Dentistry so Dr. Maryam Brazdo can help show your children the importance of good oral hygiene.